Happy 2012. We each have roughly 5,000 waking hours ahead of us in 2012. Let’s use ’em – slowly and wisely. 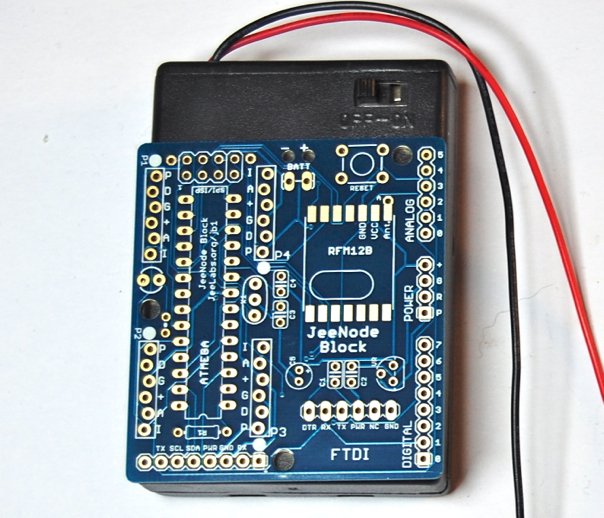 This is a recent experiment to fool around with the JeeNode form factor, as a way to create a little self-contained unit which needs no wires to operate. I’m using these blocks to try things out on my desktop (you know, the real physical one), without turning it into a huge spaghetti bowl of power supply wires, USB cables, and test hookups. The three headers at the bottom are: 8 digital I/O pins, 4 power pins, and 6 analog I/O pins. The two headers at the top are JeeNode ports 1 and 2. 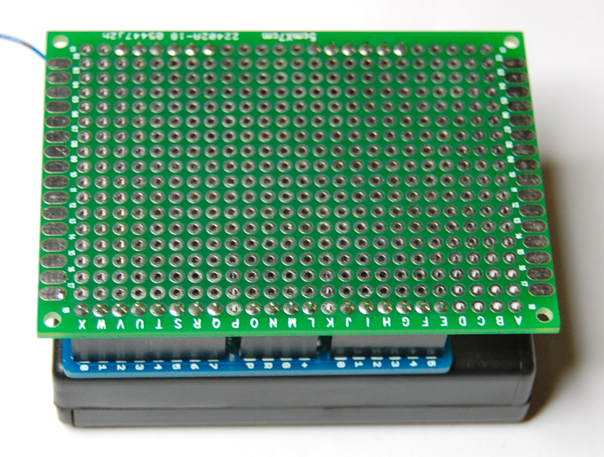 There’s a reset button, an LED, and an FTDI header for uploading new code. The 3x AA battery pack will power the whole thing at 3.6 .. 4.5 V, depending on the type of batteries used. There’s a regulator on board to run at 3.3V, as with all the other JeeNode variants. 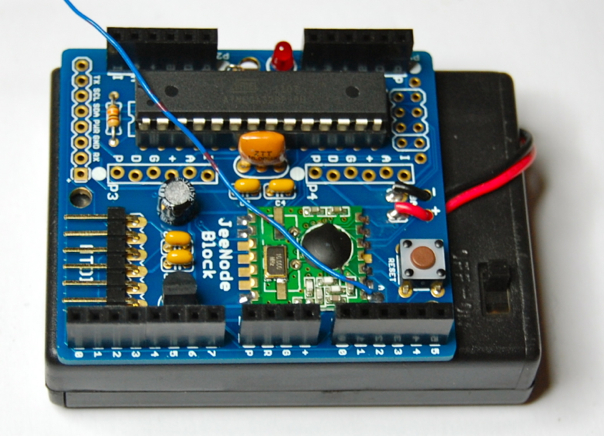 As special encouragement to “start 2012 by tinkering”, I’ll add a JeeNode Block PCB and a prototype board for free to the first three dozen or so people who order a JeeNode from the shop and ask for it. You can then simply re-use all the JeeNode parts for this board (except for the JeeNode’s PCB), since everything is more or less the same. A few missing components will also be included: extra headers, an LED, and the reset button. To take advantage of this offer, select “JeeNode w/ extra Block” from the pop-up list on the order page. Note: this offer is limited to at most one Block per person. If you come up with a neat project for the JeeNode Block, I encourage you to share your invention on the forum. Happy 2012. With 5000 hours to discover your passion, extend your knowledge, and unleash your creativity. A happy new year to you. Thanks for the inspiration, keep this going! Do you throw in the different headers too? You have no options for 8-pin and 4 pin headers in the shop atm. If not, where can I get them? Sorry, I didn’t read the post correctly… But at the same time, this is a subtle hint, since the Carrier Board also needs 4 pin headers, and the “cutting headers” solution is messy and annoying. Oooooh, this looks very much like a prototyping board I’d been trying to design in Eagle. Unfortunately I gave up due to complete frustration with Eagle! Must resist… must resist… Must not visit shop under several identities and attempt to order 3! Just out of interest, why the PD2 to PB0 relocation? One should be enough right? I’ve glued a JeeNode v4 onto a battery box to create my own easy and early version of this “JeeNode Block” somewhere in June 2011. It works quite nicely, but it would be nicer to have this solution sitting on my desk. By the way, If you missed this offer somehow, hot glue is great for securing JeeNodes to whatever kind of material. Best of all is that you can nearly always get it off completely without damaging anything and most versions of hot glue are non-conductive. Oh, nothing big really – just wanted to free D0..D7. The real “want several of those” part for me is the protoboard, I can’t find a useful size like that over on my little island, and any that appear close seem priced close to the cost of getting some custom etched! Of course I could just be failing with my searches and I welcome anyone who wishes to call me a muppet, on the condition that said name is accompanied with a URL for the source. I purchased a JeeNode from Modern Device, can I still receive the box? JeeNode Blocks are out of stock, sorry.